The Sparrow family is ready for their trip south for the winter, but Papa’s wing is hurt and he cannot make the trip. He asks the trees for help. One by one, the mighty, leafy trees of the forest say no! Will any of the trees help Papa Sparrow? What will happen to the selfish trees that turned him away? 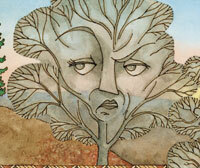 Discover why some trees lose their leaves in winter in this folktale. The Sparrow and the Trees is a Fall 2015 book release by Arbordale Publishing. A folktale is a traditional story that tries to explain or understand the world. It's not always right but it's usually entertaining. The Sparrow and the Trees is told in folktale form, narrating a story of how some trees are able to keep their leaves in the winter while others aren't able to. The story tells of a sparrow who has an injured wing who sent his family south for safety. The sparrow goes around to different trees looking for shelter and food. Some trees deny his request for help but the Spruce, Pine, and Juniper trees offer what they have. Because some of the trees were selfish, they were delegated to spend the winter months with no leaves or berries on their branches. The moral of the story is that the trees who helped the sparrow were able to survive the harsh winter months without losing their leaves. It's a fascinating tale. 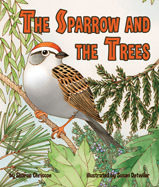 After reading the story, children can examine the "For Creative Minds" section in the back of the book to learn about sparrow migration, correlation between birds and trees, tree adaptations, and types of trees. One person will win a book copy of The Sparrow and the Trees. I like Weeping Willow trees. I love Sugar Maples, their leaves are a beautiful shape and they turn such pretty colors in the fall. I love Cardinals. Their bright red feathers and beautiful tweets make my day. We like maple trees and male cardinals with their lovely red feathers. My favorite bird is the Oriole. I think all birds are beautiful, even vultures, but I guess the owl is one of my favorites. My favorite Bird is tthe Blue Jay and my favorite tree is the Weeping Willow! My favorite bird is a Cardinal and my favorite tree is a Magnolia tree! My son and I love owls too! Eucalyptus trees are my favorite. Cardinal birds are my favorite.